The brownie is America's favorite bar cookie. In the late 19th century, the Sears and Roebuck catalog reportedly published the first brownie recipe. The basic brownie ingredients include flour, sugar, eggs and butter base, with chocolate, which gives them their characteristic brown flavor. Today, nuts, coconut, chocolate chips and a variety of flavorings make brownies versatile and fun to eat. In recent years, nutritional concerns have inspired a societal conversation about the advantages of cooking with certain baking ingredients, including oils and butter. The challenge in baking and observing health is including the most healthful ingredients that will not compromise the taste and texture of the dish. In the case of brownies, butter and oil offer different benefits and disadvantages that each baker needs to weigh to make an informed choice about which is best. Baking recipes ordinarily require unsalted butter because it does not contribute additional salt to the recipe. You may also choose organic butter derived from cows that eat only organic feed, which eliminates the possibility of consuming pesticide residue. Particular oils are more conducive for use in baking because the flavor is neutral and does not interfere with the taste of chocolate and other ingredients the brownie showcases. Light olive oil, sunflower, safflower, grapeseed and canola oils are neutral and may be included in brownie recipes. The primary nutritional values relevant to deciding between oil and butter in brownies are calorie and saturated fat. Calories dictate the amount of energy and potential weight gain eating them will contribute to your health, and saturated fat is harmful because it clogs arteries and increases the risk for developing the most serious disease affecting Americans as of date of publication--heart disease. Additional factors are vitamins A and E, which exist in trace amounts in some oils. According to the U.S. Department of Agriculture Nutrient Data Laboratory, butter includes 102 calories, 7.3 grams of saturated fat, 355 international units vitamin A and 31 milligrams of cholesterol; safflower oil contains 120 calories, .8 grams saturated fat and 6.9 international units of vitamin E; and sunflower oil includes 120 calories, 1.4 grams of saturated fat and 8.3 international units of vitamin E. Safflower oil contains the lowest level of saturated fat, butter offers the lowest level of calories and sunflower oil provides the most vitamin E compared with other oil types. Depending on whether weight control or cardiovascular health is most important to you, one of these three has optimum nutritional value. Omega-3 and omega-6 fatty acids improve the body's immune system, reduce inflammation, improve the diffusion of nutrients across the membrane of cell walls and fortify the brain. These nutrients traditionally exist in balance in the diet, but modern industrialization of food production changed the ratio and now omega-6 oils are predominant. To rebalance the scale and your health, including as many omeg-3 oils in the diet is important, according to the Harvard School of Public Health. 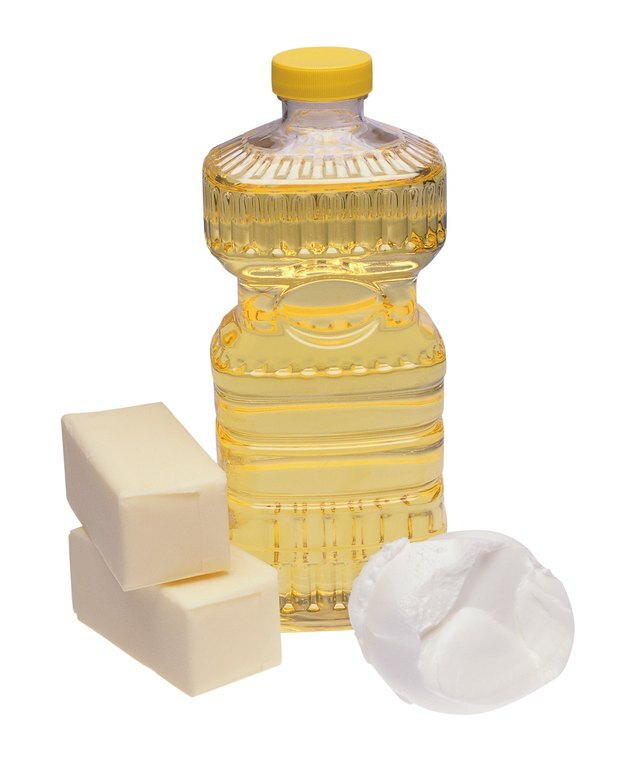 The omega balance in butter and oils is a criterion for making a decision between the two ingredient types. Butter offers 2 percent omega-6 and 2 percent omega-3 fatty acids. Canola oil provides 20 percent omega-6 and 9 percent omega-3 fatty acids. According to the Peak Performance website, canola oil offers the highest level of omega-3 fatty acids and butter contains the lowest level of omega-6 fatty acids in comparison to other oil types. If you have health concerns regarding inflammation disorders, such as joint pain or autoimmune diseases, either of these options is beneficial. The roles of fat in baking in relationship to texture and function are two-fold--they coat flour's gluten strands, which prevents clumping and promotes a tender texture, and they stiffen during the mixing process, which provides additional aeration for the carbon dioxide released from leaving agents, such as baking powder to fill and rise the dish. In brownies, both butter and oil will offer a moist, tender texture, but only butter will give the dish the aeration needed for rising brownies well. If you use a cake brownie, butter is a better option because it helps rise the batter. For denser, fudge type brownies, oil is permissable. The flavor of butter versus oil may be the tipping point if saturated fat is not a concern, because butter far and above other fat ingredients gives baked dishes a caramelized, nutty, deeper flavor that complements chocolate. If the other ingredients, such as nuts or caramel, provide significant flavor and butter would not be missed, oil, for its heart-healthy benefits, may be the best option.